Below is an excellent video for teaching your team how to utilize screens in your motion offense. The specific situation covered in this drill is passing then screening away. 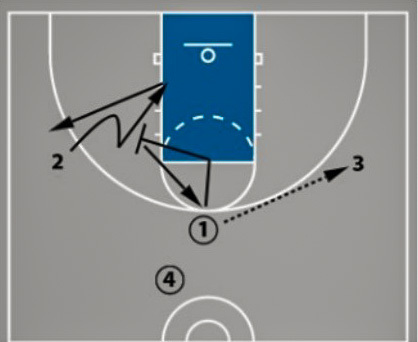 Tim Schuring presents three options for the player receiving the screen. And as you will see, the teaching is phenomenal. It's one of the best videos out there detailing how to set and attack screens. The drill starts with a player on the top of the key, a player on the right wing, and a player on the left wing. A fourth player is behind the player on the top of the key. This player is just a designated passer. It could also be a coach or manager. Both people at the top of the key start with a basketball. 1 passes to 3, then 1 immediately sets a screen for 2. 2 utilizes a blast cut to the fill the top of the key. 1 fills the left wing. 3 passes to 2. 2 passes to 1. 3 blast cuts to the top of the key. 1 passes the ball to 3. 3 shoots. 2 shapes up. 4 passes the ball to 2. 2 shoots. 2 utilizes a curl cut. 2 cuts to the basket then fills the left wing. 1 shapes up to fill the top of the key. 3 passes to 1. 1 passes to 2. 3 curl cuts to the basket. 2 passes the ball to 3. 3 shoots. 1 shapes up. 4 passes the ball to 1. 1 shoots. 2 utilizes a backdoor cut. 2 cuts to the basket then fills the left wing. 3 backdoor cuts. 2 passes the ball to 3. 3 shoots. After drill is finished, the next group starts. The players who just completed the drill rotate counter clockwise or to the right. As Coach Schuring said, you want to get the ball reversed quickly. By passing the ball quickly, the defense will have more space to cover in less time. This will create a bunch of mini offensive advantages for you. As Tim Schuring says, if you want open shots, set good screens. By setting good screens, the screener is often the one open for shots. To get a better angle on the screen, you should fake a cut towards the rim and slightly towards the player with the ball. This will be one to two steps towards the basket. By sprinting to the screen, it gives the defense less time to react. This makes you harder to guard. It also makes it harder for the defensive player to get in position quick enough to defend the screen properly. Coach Schuring doesn't encourage you to raise your hands to set screens. He wants you to just focus on setting a solid screen. 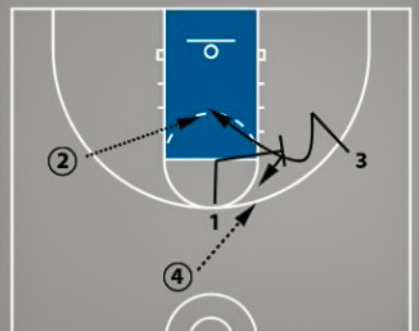 After the cutter clears the screen, you (the screener) cuts to the ball or rolls to the basket. By waiting until the cutter clears, this also helps you (the screener) recognize which space is open. If you (the screener) choose to shape up, immediately pivot and square your chest to the passer. This puts you in an ideal position to see both the defense and the ball. Before you even receive the pass, this helps you make decisions quicker by recognizing if you should shoot, drive, or pass. Quicker decisions often lead to better scoring opportunities. By getting below the screen, this helps set up the defender. Now when you cut, the defender has to make a choice to run into the screen or run around the screen. Both situations create more space for you. As Coach Schuring says, it doesn't matter if you jog or walk down. It's just important to change speeds. It's probably even smart, to mix up your approach speed to keep the defender off balance. Once you get below the screen, EXPLODE out of the cut. This change of pace makes it very difficult for the defender to react in time. And if they cheat or overplay one direction, you can cut the opposite way. By rubbing your shoulder against the screener's hip, this creates little space for the defender to slide through. This forces them to go around or get caught on the screen. Also, by getting low and touching the screener's calf, this makes it harder for the defender to push you off of your cutting path. You want to time the cut, so the screener is not waiting. You want to explode off the screen as soon as the screener tops. This gives the defender less time to react. You want to get your top shoulder above the screener's top shoulder. By forcing the defense higher, this does two things. It creates more time for the passer to recognize the cut. It gives the passer more space to make the pass. Thus, you will get more opportunities to score when you are open. As mentioned, when the cutter goes backdoor, this is an automatic trigger for the screener to shape up. That way, you (the screener) can immediately cut to the ball. This forces the defense into a difficult decision. Does the help defender stay with the player who cut backdoor or do they rush out to guard you? It's very difficult to stop both options. The DVDs and eBooks include a step by step process for teaching motion offense, transition offense, secondary break, set plays, out of bounds plays, press breakers, and zone offense. This is good stuff. I am considering buying this but would like to know what I could learn outside of Don Kelbick's motion offense video; which I already have? I believe both serve their own slightly different purposes. If I'm a coach who wants to learn about the comprehensive topic of motion offense (with dozens of screens, cuts, and concepts), Don Kelbick's DVDs are some of the best out there. This applies to every level of coach. Don also shows you examples of how he progresses with drills and concepts within the motion offense. Some of the 4v4 and 5v5 situational drills are staples for when I teach offense. However, you choose what cuts, screens, and concepts you want to implement into your offense. The product doesn't tell you which ones to choose. So if you don't plan on coaching for multiple years, maybe it's not the best fit. A lot of youth coaches like it. Some youth coaches really liked it from an educational standpoint, but wanted more specific direction and progressions. That's where Tim Schuring comes in! He shows exactly what he teaches to his youth and high school club programs. And he shows you how to teach it step by step. It is also comprehensive... transition offense, secondary break, motion offense, zone offense, set plays, etc. He even breaks down concepts by age levels such as 3rd/4th grade, 5th/6th grade, 7th/8th grade, and high school. And he breaks the little important details that will make you better at cutting, screening, timing of actions in plays, etc. Another thing I like about Schuring is that his teachings and progressions are very, very similar to what we believe is best for youth and high school players. Both products have made me a much better coach. So it's hard for me to say if one is better than the other. If budget is a limit, buy both and return the one that is least applicable. If neither work, return both. That's why we have our 100% money-back guarantee. No questions asked. Very helpful info, Joe. Thanks! 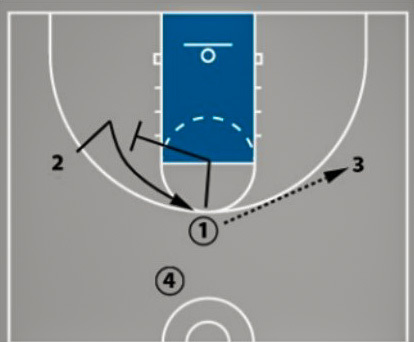 Excellent video for drills for screening in motion offense. I am in the same situation as Malcom. I just bought Don Kelbick's motion offense DVD's. Will this be a big help? NVM.... just refreshed the page and saw Joe's reply. I appreciate all the information from this website! This video is especially helpful. 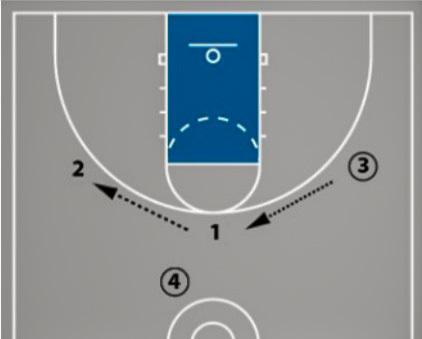 One question I have is in a girls 5th grade league where teams mostly use a zone defense, does a drill like this prepare them for real game-like movements? My girls do a good job moving around the floor, but I cannot get them to set and use screens during a game. Thanks! This drill is one small piece of the process. 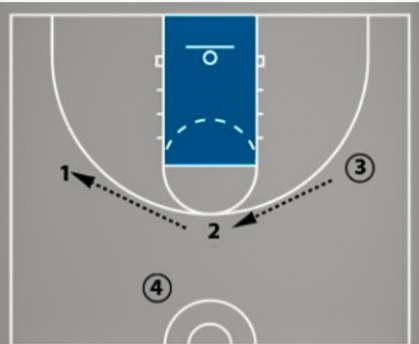 The purpose of this drill is to teach players the basic aspects of screens/cuts, develop habits, and practice shooting/finishing/passing at the same time. In addition to this drill, you'll want to practice against defenders 3v2, 3v2, 3v3, 4v4, 5v5, etc to teach players how to screen defenders. Against zone defense Coaching Schuring makes some adjustments to the motion offense. The base rules are the same but the rules are tweaked to make the motion more effective against zone. That is covered in chapter 15 of the DVDs. I liked this a lot and used it with my team and it was incredibly helpful. I'd love to have it but I just don't like DVD''s. Are you guys looking at the possibility of offering an Instant Download or streaming platform? Also if you end up buying the DVDs those coming with streaming video in the members area. If any other questions let us know. 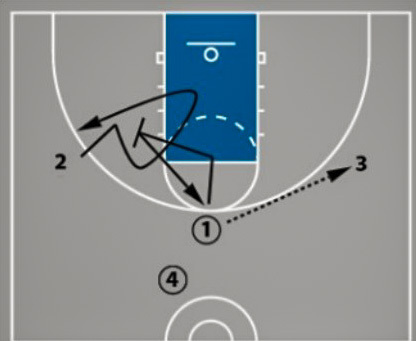 How do you teach players when to screen and not to in the motion offense? I am finding that my players are not screening when they need to or vise versa. It depends on the motion you are teaching. You could instruct players to always screen or cut after they pass. You could instruct players to always screen or cut when they are 1-pass away from the ball and NOT open. Some coaches have a 3 second rules... do not stand for more than 3 seconds. There are lots of different motion offenses out there and different rules... those rules are what make each motion offense unique. If you have a certain motion offense and rules you use, let us know and maybe we can point you in the right direction. But generally speaking, you play small sided games and scrimmage to teach players when to screen and keep them moving. The "freeze" command is a great way to teach during the small sided games or scrimmages. If you see a player pass and forge to cut or screen, yell freeze and ask "what are you supposed to do after passing?". With reps and emphasis from coach, they will get it.